Phone No.- 0535-2703875 . (Sponsored by Bank of Baroda). 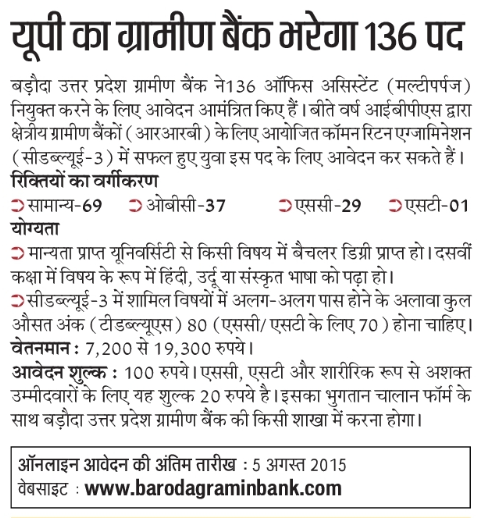 For General-69,for SC-29,for ST-01,for OBC 37 Posts,Total-136 Posts. Pay Scale-7200- 400/3, 8400- 500/3, 9900-600/4, 12300-700/7, 17200-1300/1, 18500-800/1, 19300. Approximate Salary : 15674/- per month. Qualification : Eligibility as per IBPS rules + Proficiency in local language. Probation Period : One year for Office Assistant (Multipurpose). Relaxation of age : For Scheduled Caste/Scheduled Tribe 5 years.For Other Backward Classes 3 years.For Persons With Disability 10 years.For Persons affected by 1984 riots 5 years.Change of address will not be entertained. Marks of Interview : 30 marks. Application fee : Rs.100/- for General and OBC candidates,Rs.20/- for Schedule C/ST/PWD/ESM candidates by means of a Payment challan.